A Mercury-Mars sextile today should have you feeling alert and active, mentally and physically. Even if you’re not so sure that you are, notice how your body is feeling. If you can connect the dots between your body’s sensations and what they might be telling you (beyond the basic “I’m cold” or “I’m hungry”) you might find it easier to shift gears. Today’s Birthdays: Felix Mendelssohn (1809-1847), Horace Greeley (1811-1872), Elizabeth Blackwell (1821-1910), Gertrude Stein (1874-1946), Norman Rockwell (1894-1978), James A. Michener (1907-1997), Simone Weil (1909-1943), Robert Earl Jones (1910-2006), Henry Heimlich (1920-2016), Kenneth Anger (1927), Johnny “Guitar” Watson (1935-1996), Michael Cimino (1939-2016), Blythe Danner (1943), Dennis Edwards (1943), Melanie (1947), Nathan Lane (1956), Warwick Davis (1970), Sean Kingston (1990). The recent Leo Full Moon and lunar eclipse put us squarely in ‘the eclipse zone’, with a partial solar eclipse coming Feb. 15. 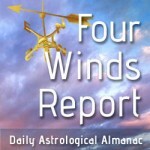 However you experience the next couple weeks, as Amanda Painter writes, the major aspects of the next few days could give you some ideas about the overall atmosphere you’re operating in. The primary player looks like Venus in Aquarius. Moon Phase: Moon is in Full phase and enters Waning Gibbous phase today at 1:48 pm PST / 4:48 pm EST (21:48:28 UTC). Next New Moon is in Aquarius (Partial Solar Eclipse) on Feb. 15 at 1:05 pm PST / 4:05 pm EST (21:05:07 UTC). Moon Sign: Moon is in Virgo and enters Libra today at 1:47 pm PST / 4:47 pm EST (21:47:00 UTC). Moon enters Libra at 1:47 pm PST / 4:47 pm EST (21:47:00 UTC). — Mercury square Pelion at 10:22 pm Feb. 2 PST / 1:22 am EST (06:22:24 UTC). — Mercury square Pallas at 2:08 am PST / 5:08 am EST (10:08:10 UTC). — Mercury square 1992 QB1 at 3:12 am PST / 6:12 am EST (11:12:06 UTC). — Mercury sextile Mars at 7:57 am PST / 10:57 am EST (15:57:15 UTC). — Sun conjunct Okyrhoe at 1:48 pm PST / 4:48 pm EST (21:47:42 UTC). — Mercury square Typhon at 4:56 pm PST / 7:56 pm EST (00:56:19 Feb. 4 UTC). — Venus square Bienor at 7:27 pm PST / 10:27 pm EST (03:26:37 Feb. 4 UTC). You have an unusually clear view of the past, which can point you toward a future that is sometimes difficult to see. Yet knowing where you’ve been, and how you feel about it, will give you an unusual platform from which to view the future. You may decide someone or something that was of profound importance in the past is now what it’s time to focus on. This week, there’s a Full Moon eclipse in your opposite sign Leo. Think of this as a tune-up of your relationships, particularly on the emotional level. It might feel like a pressure release. A Mercury-Mars sextile today should have you feeling alert and active, mentally and physically. Even if you’re not so sure that you are, notice how your body is feeling. If you can connect the dots between your body’s sensations and what they might be telling you (beyond the basic “I’m cold” or “I’m hungry”) you might find it easier to shift gears — or to move into a new phase of something altogether. Venus in a conjunction to Juno in Aquarius is a reminder to watch out for jealous tendencies, especially in group settings or friendships (as well as in intimate relationships). The better you’re able to see the bigger picture or focus on what would benefit all involved, the less likely you are to get stuck in a rut — and the more likely you might be to reinvent some facet of relating for yourself.